I vote to express myself. I vote to hope for a great future. I vote because I can. What about you? In my own family, my parents always voted – not always for the same candidates – and the discussions around election time were heated. This year, both my daughters can vote in the presidential election in the US. All of us are going to get out and vote. I know that many of us here in the US don’t get out and vote. For many years I didn’t. I thought that my vote didn’t matter, and my ideas were too far away from mainstream to make a difference. I didn’t express myself. But does that ever make sense? Even if we are not mainstream, maybe especially if we are not mainstream, we have the right to express ourselves here. Why not exercise this right? Why not make it stronger? This year my vote goes to candidates dedicated to environmental protection, for mother earth, and who ever I think will protect our great future the best. I’m looking forward to voting and hope you will too, because we can. 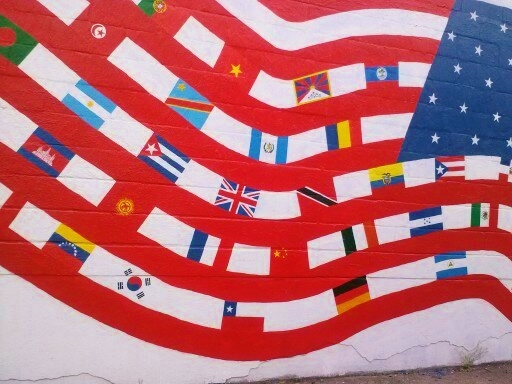 The street art on my walk home in Brooklyn reminds me we are a nation of people from all over the world. Here, we can all express ourselves through art. We can express ourselves through voting too, not just one day, but on many days at levels local through national, from community groups to presidential elections. I vote because I am lucky that I can and because I owe it to myself to have one more vote counted for the person who most represents my views. It is empowering to me. I voted and it was empowering, I agree Sophia! I vote because it’s a matter of life and death. Elected officials make decisions that determine who lives and who dies, on a massive scale. Michael, your comment touches the heart of voting – our elected officials decide about wars, and the wars have been tragic. 2 candidates came out against the war this year, this gave me hope and gave us a choice.